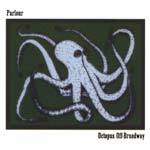 Created over the course of almost 4 years, the 7 tracks on Octopus Off-Broadway are primarily the work of Tim Furnish (although several friends contribute to about half the tracks). A moonlighting member of many different groups (For Carnation, Aerial M) and an influencial person in the early to mid-90's Louisville Kentucky music scene, Furnish sort of secluded himself for awhile while working through the different ideas for tracks on this release. Despite the somewhat long long incubation time, the release doesn't suffer from any continuity problems, and the long tracks flow together nicely for almost 55 minutes of instrumental post rock (with a touch of Ye Olde Progge). Yes, it's true. The somewhat unsteady gaze of progressive rock indeed casts a slight glance in the direction of Parlour, but only in very subtle ways. The fact of the matter is that the main attachment this release has to anything "prog" is the fact that Parlour uses a lot of keyboard sounds. The funny thing is that although you may have heard the sounds before (even on keyboards you have at home), Furnish somehow manages to make them fit into the release without sounding silly. He's not afraid to use a keyboard to create woodwind or horn sounds, and despite how silly it sounds on paper, things weave together in almost hypnotic ways much of the time, so forget your Rush comparisons already. As mentioned above, Parlour works a rather hypnotic angle with the music on this release, and they do that mainly through just the right amount of repetition and great layering of sounds. "Stipendlax" opens the album with almost watery keyboard noises and every measure another subtle sound is introduced. Eventually, the drums come in alongside guitars and bass (and some super-swampy low-end) and the different instruments shift and slide melodies in the lush track. "Aflipperput" starts out rather simply (with some of those woodwindy sounds I mentioned above) as well, but again starts piling on different layers until the fast-paced track is snaking all over with intertwining melodies. It's on "Sleeper" that Furnish's 'Electro-Octopization' (his euphemism for the multiple keyboard layers) come into full effect. Comprised solely of subtle layers of swirling guitars, a jaunty little melody (on what sounds like a french horn) cuts through everything and hooks the ear with its simplicity. After a spaced-out beginning, "Weeds That Grow Into Trees" locks into a funky little track with a nice rhythm section while the epic album closer "The Living Beginning" builds and evolves over the course of 15 minutes. The latter track even has a couple flourishes of keyboards that would sound downright new-agey removed from the context of the song, and while they certainly sound different than anything else you'd expect to hear on a record of this sort, they actually work quite well. As stated before, though, there are sounds that upon introduction simply don't sound like they'll work, but placed within the context of the songs, they do. Definitely an interesting album, with hummable melodies and compositions that unfold in almost dreamlike ways.